This week UC Berkeley released a paper suggesting it could produce a two armed collaborative robot for just $5,000, a dramatic drop from the $25,000 price point of Baxter, the cobot that Rethink Robotics introduced in 2012. If Berkeley is able to scale its robot successfully, then the cost of industrial robots has been dropping at an annual rate of 20% per year. ARK’s previous forecast was that industrial robot costs would decline to roughly $11,000 by 2025, boosting their sales at a 31% compound annual growth rate from 380,000 units in 2017 to 3.4 million units. UC Berkeley’s work suggests that ARK may need to be more aggressive in modeling the cost trajectory of industrial robots. Among the potential reasons for the accelerated decline in industrial robot costs are 3D printing and artificial intelligence (AI), the latter perhaps more important. Prototyping with 3D printing and AI has enabled design iterations at a rapid pace, but AI’s impact on motion control probably has been more responsible for the dramatic decline in costs. Most robots are “over manufactured” for their actual use cases, for good reason: traditional programming is inflexible, placing more constraints on and adding more requirements to the manufacturing process. Incorporating AI into motion control, manufacturers can build robots with fewer sensors and unnecessary capabilities (like weight lifting), optimizing their functionality. This cost decline is comparable to that in computing during the shift from mainframes to PCs, which led to the democratization of computing. Few people are anticipating the unit growth in and proliferation of robots likely to take place during the next five to ten years. MIT recently published a paper showing that, contrary to popular belief, drivers are vigilant and cautious when using Autopilot, which is important because Tesla is approaching autonomy incrementally, layering on features and keeping the driver in the loop until it completes and validates its feature set. In contrast, Waymo and others intend to solve for full autonomy before commercializing. One criticism of Tesla’s approach is that drivers will become complacent and take their eyes off of the road, increasing the risk of accidents. The MIT paper, however, shows that 90% of the time drivers anticipate tricky situations, disengaging Autopilot and taking back control of the car. Autopilot’s limited use cases today probably are preventing careless driving behavior, but more advanced levels of autonomy could cause complacency. For that reason, Tesla could delay the introduction of advanced features so that drivers will stay alert. This week Lex Fridman, one of the MIT authors who teaches a course in Deep Learning for Self-Driving Cars, interviewed Elon Musk on his podcast. Musk stated confidently that driver vigilance will become a moot point as soon as vehicles are fully autonomous and need no input from the driver. In another vote of confidence this week, Tesla announced that customers will be able to lease Model 3 but will not be able to purchase them at the end of the lease because cars coming off lease will seed Tesla’s autonomous ride hailing network. According to ARK’s estimates, autonomous Model 3s will become valuable assets, generating roughly $10,000 in cash flow per year. Public cloud may be the future, but enterprise computing is not going away and will power multi cloud capabilities during the next five years. More than a decade after the launch of Amazon Web Services (AWS), public cloud computing has taken only 30% share from infrastructure spending in the tech space. To capture the balance, companies must offer cloud-like technology for on-premise data centers. Microsoft’s Azure Stack, Amazon’s VMWare partnership, and Nutanix are going after this lucrative market. Google’s Cloud Compute Platform (GCCP)—currently ranked third in the public cloud race—just announced its own on-premise solution called Anthos. Instead of managing only on-premise workloads, however, GCCP allows IT administrators to manage workloads across all public cloud services including AWS and Azure. Effectively, Google is trying to leapfrog its competitors with a multi-cloud product. Anthos’s secret sauce is its ability to containerize workloads, making them easy to deploy across private clouds, Google, AWS, and competing public cloud platforms. Making applications agnostic to hardware platforms is one of the holy grails of computing but rarely has been successful. Google’s multi-cloud strategy follows that of Nutanix, whose company mission is to make infrastructure invisible. Nutanix gained traction first in the enterprise data center and has expanded into public clouds. Google is starting from the public cloud and is trying to gain traction on-premise. With a $600 billion total available market (TAM) in data center hardware and software, both have ample room to succeed. According to a new study published by the Federal Reserve Bank of Philadelphia, LendingClub’s lending efficiency exceeded that of the largest banks in the US between 2013 and 2016. To reach that conclusion, the Fed analyzed the difference between their nonperforming loan ratios, the ratio between the sum of all past-due and charged-off consumer loans to total consumer loans, and the best-practice ratio, the minimum ratio of nonperforming loans to total loans a lender could have achieved if completely efficient at credit risk evaluation and loan management. The difference between the actual nonperforming loan ratio and the best practice ratio is a gauge of the lender’s efficiency in assessing risk and return. The smaller the difference between the ratios, the closer the lender is to maximizing lending efficiency. 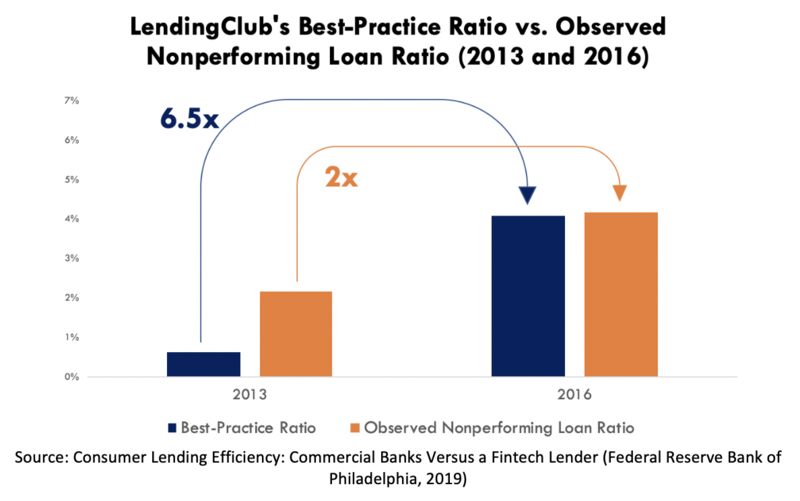 From 2013 to 2016, LendingClub’s best-practice ratio increased by more than six-fold while its actual nonperforming loan ratio only doubled, as shown in the chart below. In other words, while it increased credit risk, LendingClub was able to minimize non-performing loans, most likely because of its use of technology in assessing credit risk. A prior study released by the Philadelphia Fed described in more detail how LendingClub leverages alternative data for credit risk assessment, as discussed in ARK Disrupt Issue 166. Notably, in 2016 the difference between LendingClub’s observed nonperforming loan ratio and its best-practice ratio declined only to 8 basis points, lower than the 9 basis points of banks with more than $10 billion in consumer loan volumes. In other words, LendingClub seems to be more efficient at assessing credit risk than the largest banks in the US.